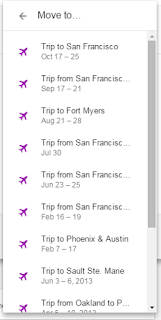 Finally, after lots of feedback, and lots of complaints, the highly coveted Trips Bundle in Inbox has received the ability to add an email to a trip. This feature started rolling out to users today. Users will have the ability to take an email from their Inbox, any bundle, or in another trip and move the message to another existing trip. Note I said an existing trip. You cannot create new trips at this time from an email. You can only add to a trip that has already been created. After selecting Move to Trips, you will see the image to the left with a list of all of your available trips. You still have the option to remove individual emails from trips when viewing the list of emails within a given trip. An email that has data that can be parsed by the system, like reservations, then the trip summary will be updated in the trip the message was moved to. In addition, the trip summary it was moved from will also be updated. However, if the message does not have data that can be parsed, then the summary will not update. Scott, how do I deal with the following issue? - I book two hotel stays, one for M-F on week A and one for M-F on week B. - Inbox groups both hotel stays into a single Trip, from M (week A) to F (week B). - I remove the email for week B M-F from the trip. 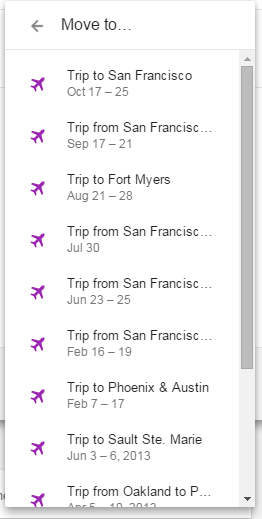 - Inbox corrects the single Trip to be for week A M-F.
- I cannot move the email for week B M-F to the general trips folder or force Inbox to create a new trip for it. John try removing the email from week B from the trip. Then forward that email to a different account. Delete the email from the original account. Then forward it back does it create a new Trip? Looks like it eventually sorted itself out. Unfortunately, there is no way to do this manually. I have booked a vacation home in Italy but Inbox has not parsed it into a Trip. Is there any way I can "force" it into creating the trip? I have tried to send me a mail with the trip information to my inbox but it has not worked. How can I create a new trip? Rehashing an old article in hopes that I am just missing something. How do you get Trip in Inbox to show up in Google Calendar? I feel like this should happen automatically. Do you have the events from gmail setting turned on in Calendar? Sure do. Checked both inbox, Gmail and calendar. THe events should be made in Calendar for things like hotel or flights automatically. They do for me. This is a hotel reservation. I have the nice TRIP bundle in my inbox on INBOX. It has the reservation email and a nice reservation data screen on it, but nothing I'm calendar. I got the bundle yesterday, does it take a few days to populate in calendar? Strange - was the email sent directly to your same Gmail account or was it forwarded to you from another account? Directly to my account. But its not a gmail account, its a custom domain that I use with gmail/inbox, its NOT a Google Apps account or G Suite or whatever they are calling it now. Could that be it? Is the calendar associated with that email or with a Gmail? Its the gmail account, not the domain that I had it sent to. Ugh.